North Carolina’s poverty rate is 2.1 percentage points higher than the U.S. poverty rate, and has the 11th highest poverty rate in the nation. The state’s poverty rate (17.9 percent) and median income ($45,906) remained statistically unchanged, meaning there has been no progress against fighting poverty or raising middle class living standards for the average North Carolinian since 2009. 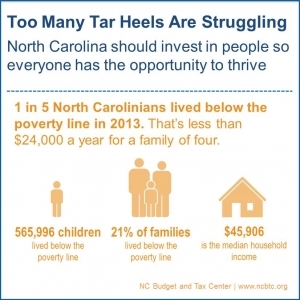 Nearly 8 percent of North Carolinians live in extreme poverty, which means they live below less than half of the poverty line—or about $12,000 a year for a family of four. Children continue to have the highest poverty rate (25.2 percent) compared to other age groups. One in 4 children live in poverty compared to 1 in 10 older adults. People of color are much more likely to struggle below the poverty line. 32.5 percent of Latinos, 28 percent of African Americans, and 28.9 of American Indians lived in poverty in 2013 while 12.3 percent of non-Hispanic whites live in poverty. Women face higher poverty rates than men, 19.3 percent compared to 16.4 percent, respectively. To make our state a better place to live and compete in today’s global economy, we need to invest in people and communities. Making it just a little easier for people to increase their earnings not only helps families struggling to pay the bills but also makes our economy stronger for all of us. Yet, North Carolina’s progress is hampered by too few jobs, a boom in low-wage work, and the 2013 tax plan—which is draining the resources needed to put North Carolina on a path to success. Cutting investments in people and communities is not the way to boost our economy and create a better future. We should take this opportunity to put our state on a better path by stopping the next round of tax cuts that primarily benefit the wealthy and use those resources to invest in strategies that will build a larger middle class by helping people move up and out of poverty. This is the first post of a blog series that will take a detailed look at the 2013 US Census poverty data released today. Read the entire series here.